A poultry operation in Egypt. 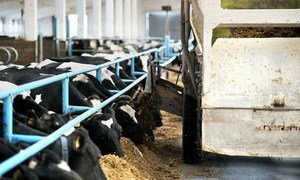 Good hygiene on farms can help stem the rise of Antimicrobial resistance (AMR) due to over-reliance on antimicrobials. Meeting at the United Nations today, world leaders signalled an unprecedented level of attention to curb the spread of infections that are resistant to antimicrobial medicines. “It is not that it may happen in the future. It is a very present reality – in all parts of the world, in developing and developed countries; in rural and urban areas; in hospitals; on farms and in communities,” Mr. Ban noted. The Secretary-General also expressed concern at loss of ability to protect both people and animals from life-threatening infections due to antimicrobial resistance. “Let me give just a few, sobering examples,” said Mr. Ban, enumerating a host of diseases that now rampant due to antimicrobial resistance. “More than 200,000 newborn children are estimated to die each year from infections that do not respond to available antibiotics. An epidemic of multidrug-resistant typhoid is now sweeping across parts of Africa, being spread through water. Resistance to HIV/AIDS drugs is on the rise. Extensively drug-resistant tuberculosis has been identified in 105 countries. And resistance to antimalarial medicines is an urgent public health concern in the Greater Mekong sub-region,” said the Secretary-General. “These trends are undermining hard-won achievements under the Millennium Development Goals, including against HIV/AIDS, TB, malaria and the survival of mothers and children. If we fail to address this problem quickly and comprehensively, antimicrobial resistance will make providing high quality universal health coverage more difficult, if not impossible,” said the Secretary-General, also noting that it would put the Sustainable Development Goals in jeopardy – a message emphasized by Mr. Peter Thomson, President of the 71st session of the UN General Assembly and convener of the high level meeting. "Antimicrobial resistance threatens the achievement of the Sustainable Development Goals and requires a global response," Mr. Thomson said. "Member States have today agreed upon a strong political declaration that provides a good basis for the international community to move forward. No one country, sector or organization can address this issue alone," Mr. Thomson stressed, at the meeting co-organized by the World Health Organization (WHO), the Food and Agriculture Organization of the United Nations (FAO), and the World Organisation for Animal Health (OIE). Mr. Ban said in order to create a world that is safer, more healthy and more productive, there was need for deep engagement, cooperation and coordination of several sectors, and sustained financing. For the first time, Heads of States committed to taking a broad, coordinated approach to address the root causes of AMR across multiple sectors, especially human health, animal health and agriculture. This is only the fourth time a health issue has been taken up by the UN General Assembly (the others were HIV, non-communicable diseases, and Ebola). Seen as a collective effort to address a challenge to health, food security, and development, countries reaffirmed their commitment to develop national action plans on AMR, based on the Global Action Plan on Antimicrobial Resistance — the blueprint for tackling AMR, developed in 2015 by WHO, in coordination with FAO and OIE. “Leaders recognized the need for stronger systems to monitor drug-resistant infections and the volume of antimicrobials used in humans, animals and crops, as well as increased international cooperation and funding,” noted the statement. 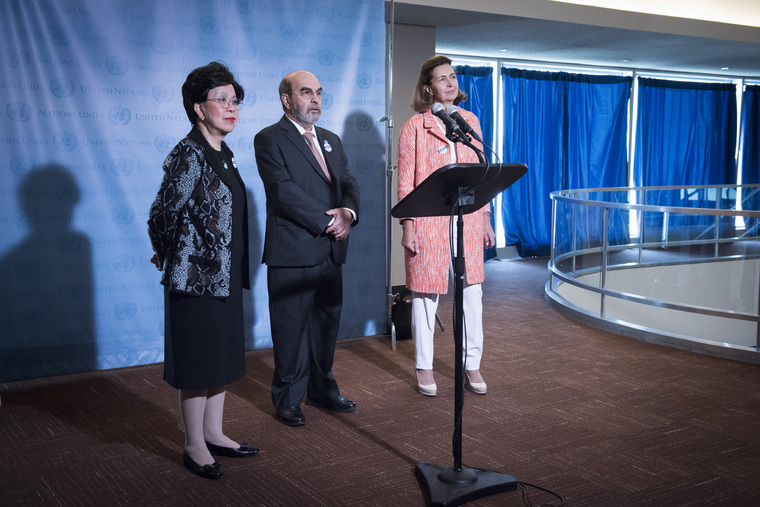 The statement also highlighted some of the commitments made by world leaders in tackling AMR. “They pledged to strengthen regulation of antimicrobials, improve knowledge and awareness, and promote best practices — as well as to foster innovative approaches using alternatives to antimicrobials and new technologies for diagnosis and vaccines,” it said. “Antimicrobial resistance poses a fundamental threat to human health, development, and security. The commitments made today must now be translated into swift, effective, lifesaving actions across the human, animal and environmental health sectors. We are running out of time,” said Dr. Margaret Chan, the Director-General of WHO. Common and life-threatening infections like pneumonia, gonorrhoea, and post-operative infections, as well as HIV, tuberculosis and malaria are increasingly becoming untreatable because of AMR. “Left unchecked, AMR is predicted to have significant social, health security, and economic repercussions that will seriously undermine the development of countries,” noted the joint statement. According to WHO, FAO and OIE, the high levels of AMR already seen in the world today are the result of overuse and misuse of antibiotics and other antimicrobials in humans, animals (including farmed fish), and crops, as well as the spread of residues of these medicines in soil, crops and water. Within the broader context of AMR, resistance to antibiotics is considered the greatest and most urgent global risk requiring international and national attention. At the meeting, countries called for better use of existing, cost-effective tools for preventing infections in humans and animals, including immunization, safe water and sanitation, and good hygiene in hospitals and animal husbandry. “Putting in place systems to ensure more appropriate use of existing and new antibiotics is also essential,” noted a joint statement from the joint organizers of the meeting. Highlighting market failures, they called for new incentives for investment in research, and development of new, effective and affordable medicines, rapid diagnostic tests, and other important therapies to replace those that are losing their power. They also stressed that affordability and access to existing and new antibiotics, vaccines and other medical tools, should be a global priority, while taking into account the needs of all countries.